I did not have to go far afield to get the reference for this 5x7 late autumn painting as this scene is only a few minutes drive from my house. There are many barns, large and small in the New England countryside, many of them belonging to still-working family farms. In fact, the last time I counted, there were at least ten small farms within a five mile radius of my home This one was owned by the Church family for generations. 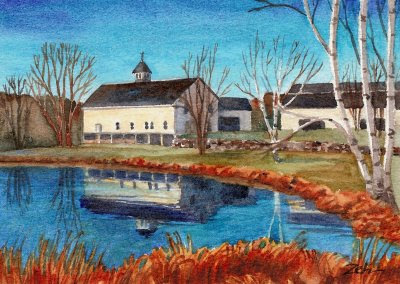 I like the way the barn is reflected in the still, deep blue waters of the pond. The sky is also a deep blue, the kind you see on a clear, crisp, cold autumn day up north.